Get Outside This Weekend and Enjoy Earth Day! Sunday, April 22nd is Earth Day. Have you figured out how you're going to honour the planet? If you need ideas, there are a whole bunch of activities being planned around the country. In Ottawa, there are a variety of events around town, including an Eco Expo at the RA centre and Earth Day celebrations for the family at Petrie Island. If you're not going to be in Ottawa, check out Earth Day Canada site's comprehensive list of events around the country. This year, there is a campaign called: Take It Up, challenging people to take up a good habit to help the Earth. 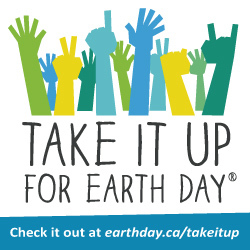 Help clean up your community, plant a school garden, conserve water... and head over to the Take It Up site to share and possibly win prizes. Every time someone joins Earth Day, they're more than just a member. They're a catalyst for change. Love that *so much*. Happy Earth Day to you and yours!